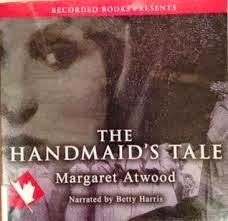 Audiobook Cover: "Sometimes described as a woman's 1984, Margaret Atwood's powerful best-seller is a politically astute mix of reality and fantasy. The Handmaid's Tale portrays a chilling world of the near future, when women no longer have status and are viewed only as property. Ever since a coup d'etat by religious cultists left the President and the Congress dead, the United States of America has been known as the Republic of Gilead. With most of the population rendered sterile by environmental pollution, the remaining fertile women are kept as breeding stock or handmaids. Thirty-three-year old Offred, Handmaid to a ruling Commander, shares the horrifying story of her new life. Made into a popular motion picture, the novel is even more compelling as it addresses issues of autonomy and individual freedom. Narrator Betty Harris' dramatic performance will put you on the scene with Offred as she struggles to make her way in the harsh new place called Gilead." Taryn's Review: Recently I had a few days of travel on my schedule, and I thought about how I needed to pick out some audiobooks and order them from the library for my trip. Naturally, that didn't happen. So I frantically rushed into the library, since I was running behind (of course), and gazed at my library's very-limited audiobook selection in front of me. As I scanned a few audiobooks and selected a few (one being One Man Guy by Michael Barakiva), this one looked kind of ragged on the shelf. I passed it over twice due to how beat-up it looked, but on the third glance I realized that the author's name seemed faintly familiar, so I figured I'd give it a shot. Oh. My. Gosh. I am SO glad that I selected this book. It's brilliant. Amazingly brilliant. Stunning. This audiobook was 10 cds long and I didn't want it to end. I looked forward to driving in my car just so I could listen to the book. Margaret Atwood blew my mind with the storyline and the meticulous detail that she put into it. I was on the edge of my seat during most of the book, never knowing what was about to happen. Offred's life in Gilead was terrifying to think about in real terms. She was a person with agency in her old life but, after the overthrow of the United States and the Republic of Gilead's creation, she was suddenly degraded to a reproductive vessel with no rights. She was sent to a "school" informally called the Red Center to learn how to be handmaid and what was expected of her; once out, she had one role to fulfill: reproduction. Failure to reproduce meant being sent to do jobs in the Colonies, jobs that would ultimately end in death. The isolation, the regiment, the fear, the loathing, the longing, the hope that Offred experienced throughout the book was mesmerizing. As a reader, I really felt like I was sitting next to Offred, hearing her personally tell the tale of her life. My only complaint was that the actress who portrayed Offred sounded much older than the 34 years old that Offred was supposed to be. Based on voice alone, I thought Offred was in her late 40s or early 50s. I saw on Amazon that there is a version of the audiobook where Claire Danes portrays Offred, which I think would be a better choice for listeners. I am utterly impressed with Margaret Atwood's talent in this book. I can't rave enough about it. I highly recommend this book.